Jay Lagemann at work on his most popular creation, Swinging Jenny. In a cloud of smoke and shower of blue sparks, Island sculptor Jay Lagemann blasts the stainless steel braids of his newest humanoid creation with a blowtorch registering over 3,000 degrees. The metal begins glowing red as it heats up and Mr. Lagemann starts bending the braids to his will using a vice grip. A few yanks later, the braid shows a slight curve and inclination, as if a little disheveled from the wind. Mr. Lagemann comes down from a ladder and slings the torch back into its holder where it extinguishes with a loud pop. “That’s definitely better,” he says while taking off heat-protective gloves and protective glasses for a short break. The sculpture of a seven-foot steel marionette man swinging a young girl towers above him. The man leans back slightly from the force of the swinging girl whose legs and hair braids jut out into space. The sculpture is called Swinging Jenny after one of Mr. Lagemann’s stepdaughters. There are no faces, just steel hoops for heads, but a sense of unbridled joy permeates the piece. The girl seems to defy gravity and give the illusion of movement, despite being solidified in heavy steel. Swinging Jenny is one of Mr. Lagemann’s most popular creations, with over 150 crafted since he made the first one in 1991. A completed version is displayed outside the Field Gallery in West Tisbury. The man is painted a bright red, the girl a bright yellow. Mr. Lagemann explains how the colors and featureless frames of the bodies speak to the universality of the piece. Vying for the title of most popular work is his iconic Swordfish Harpooner at Menemsha beach, commissioned by the town of Chilmark in 1994 and refurbished in 2017. Mr. Laggeman’s studio is large, naturally lit, and cluttered with every imaginable good that can be purchased from a home improvement store. Tomato cans and Maxwell House coffee containers are used for tiny things like screws. Counter space is nonexistent. An unused buzzsaw from his woodworking days sits to the side. A fire extinguisher collects dust by the corner next to phone numbers scrawled on the walls. The sculptures begin as clay molds, tightly packed together to create the form that a foundry in China will cast into stainless steel. To get the Swinging Jenny to the foundry, Mr. Lagemann cuts the mold into about 12 pieces and ships it in several oversized cases. 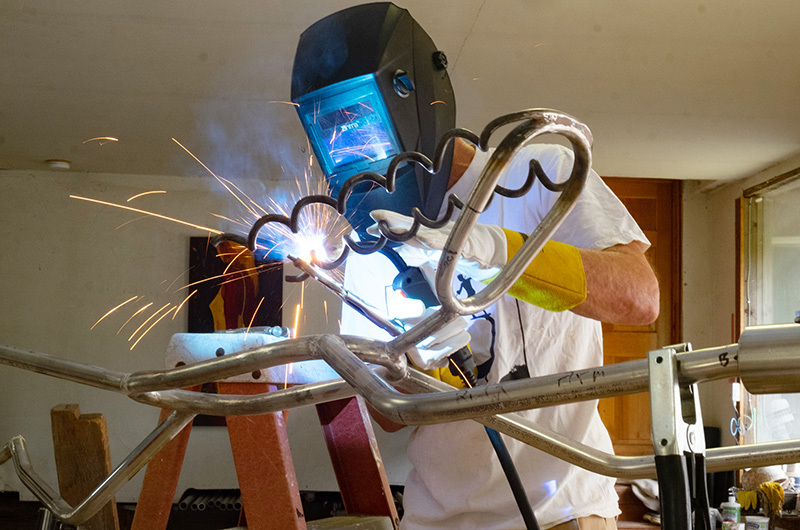 After the pieces return as one conjoined steel sculpture, he begins making adjustments before spray-painting the steel with vibrant colors. The colors match Mr. Lagemann’s personality. His face lights up while he works as if he’s making the Swinging Jenny for the first time, not the 150th. 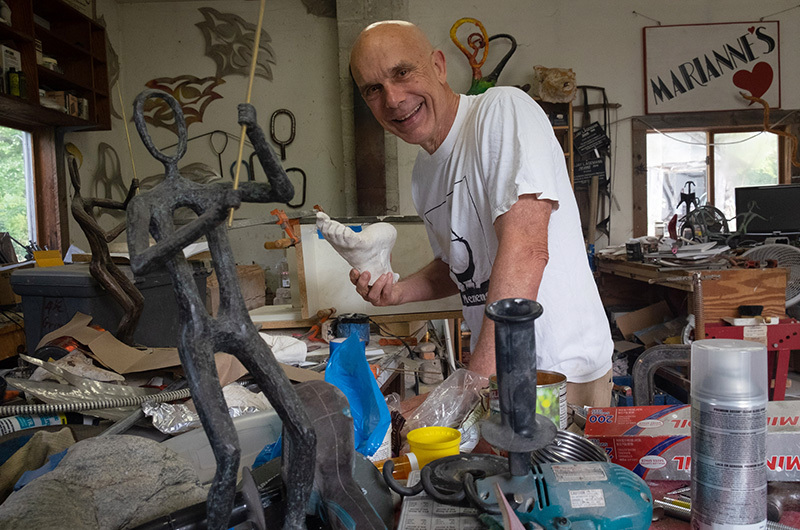 He says it’s because all of his sculptures were originally made for people he loves and each re-creation reminds him of the friends and family they represent. Outside the studio, more than 50 of Mr. Lagemann’s lively and imaginative sculptures are scattered around the landscape. There’s a girl hanging off the handlebars of her bike, two dogs high-pawing and a man yanking a striper out of a pond. Mr. Lagemann smiles as he looks at each one fondly. Another finished Swinging Jenny sits outside the door of his studio, gleaming in the bright morning sun. It sways a bit in the wind, but the girl hangs on tight. Mr. Lagemann says he often sees fathers and daughters posing for swinging photos, re-enacting and completing the sculpture. 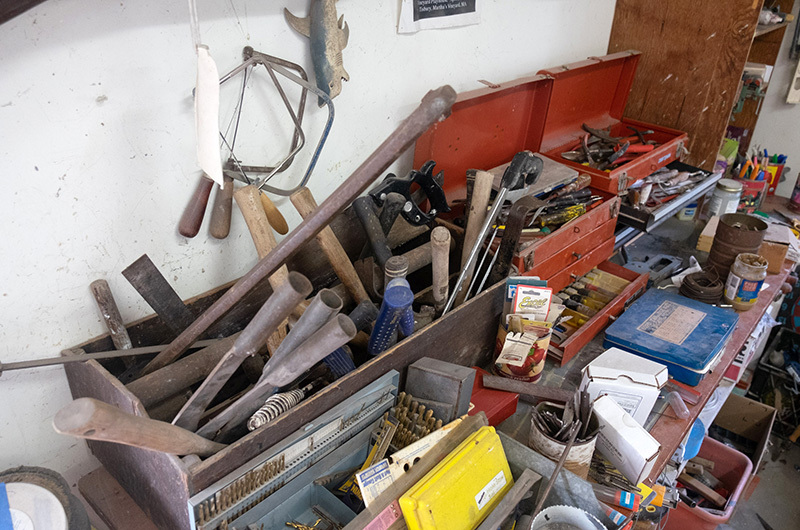 I laughed out loud when I read the photographer Mark Lovewell’s comment “Everything an artist needs, right were he left it.” What a nice way to say my studio is a mess. And I had thought I had cleaned up pretty well.